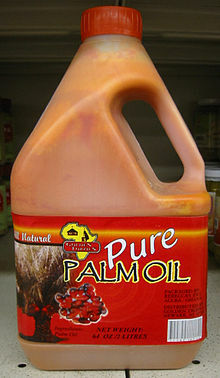 Palm oil is a cooking as well as edible oil in various other ways. 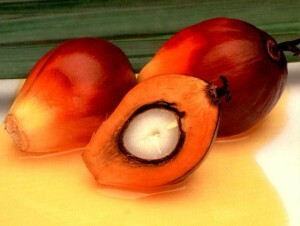 It is derived from the red pulp of the palm fruit. 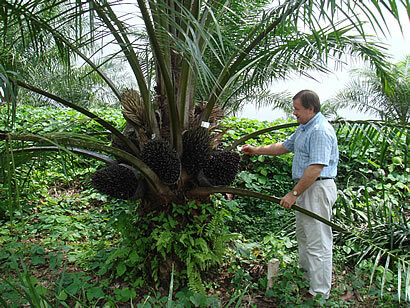 It should not be confused with palm kernel oil, which is obtained from the nut or the seed of this fruit. 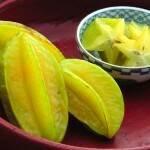 It is a very common cooking medium in Southeast Asia, parts of Brazil and the tropical belt of Africa. 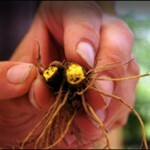 The oil is used around the world in many forms, edible and inedible. 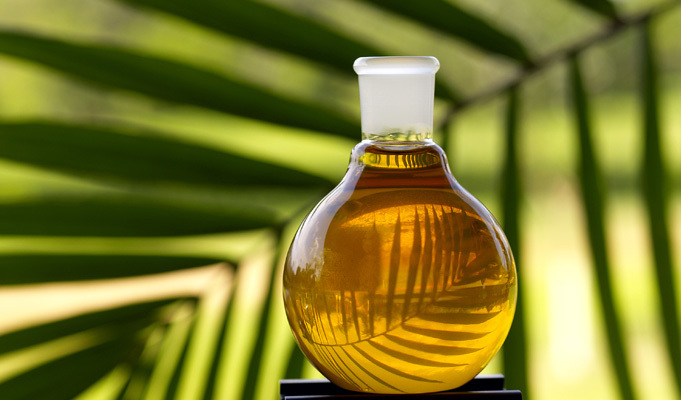 Find out the physical description of palm oil in here. Color: It has a rich amber or honey red color. Smell: The oil is does not have any identical smell of its own. Taste: This oil possesses no identical taste of its own as well. 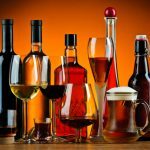 Density: It has a density of 0.9210-0.9240 at a specific gravity of 15.5 degree Celsius. Palm oil starts smoking up at 455 degree Fahrenheit or 235 degree Celsius. Frozen palm oil blocks melt at 35 degree Celsius. Choose ripe palm fruits that have dark red or black outer skin. Break the fruit apart into two halves. Remove the seed or the kernel. Put the palm fruit in a hand motor to crush the fruit into pulp. Bring the pulp to boil for about 30 mins. to remove the excess water from the pulp fibers. Line the funnel properly with a fine cheese cloth. Place the emitting end of the funnel inside a glass jar. Strain the pulp through the cheeses cloth and the oil will drip into the jar. The oil filled jar should be tightly sealed. Per tablespoon of palm oil contains the following amount of nutrient. Being low in unhealthy fats, palm oil is quite beneficial for health. 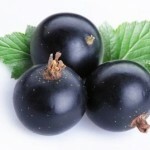 It is full of anti-oxidants which protects the skin cells and keeps it healthy and glowing. It is Trans-fat free and thus it does not encourage fat accumulation in blood vessels. 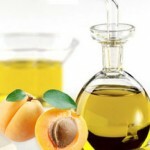 The oil does not interfere body’s natural fat metabolism. It is a healthy option for those who are sensitive towards cooking oil’s smell and taste since it is odorless and tasteless. 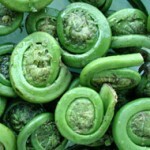 It increases good cholesterol level in the body. 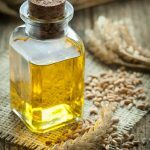 Research shows that one of the components of this oil overturn blockage of the carotid artery, thus preventing cardiac arrest, arteriosclerosis and stroke. Red variety of palm oil reduces breast cancer cell growth. 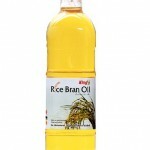 This oil is a good source of energy due to satisfactory amount of healthy calories. 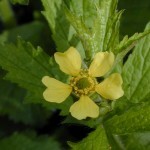 It increases the immunity system. 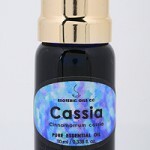 This oil helps controlling the chronic diseases. 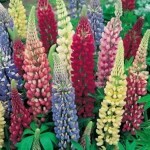 It has components that slow down aging of the cells. 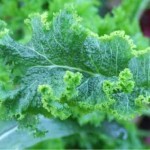 Reduces the chances of Vitamin A deficiency. Some people may suffer from hives. Some may experience skin rashes. Sometimes a burning sensation can be experienced. Tingling sensation in the mouth, tongue and lips may occur. Some people might feel nausea. Some people may feel like vomiting. Dizziness is another common allergy symptom. It induces breathlessness in some people. It encourages low blood pressure in people who have a low BP tendency. It is suggested to include this oil in regular diet of pregnant women to prevent them from vitamin A deficiency and the baby’s healthy growth. The oil finds its use in many ways to the convenient of human daily lives, some of which are even unnoticed. Since it is odorless and tasteless so it is used in the preparation of sponge cakes and pastries. It is used in baking cookies. The oil serves as a fat-free substitute for coffee cream. The oil is also substituted for fat in condensed milk and milk powder. The oil serves as the most popular oil for fat-free fries at home and commercially. The oil is used in many cardiac pills. Some cancer drugs may also contain this oil. This is one of the components in diet pills. 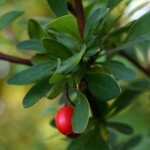 It is used in many vitamin supplement pills. 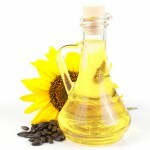 The oil is vastly used in manufacturing skin care medicinal products for external use. The oil is vastly and most commonly used as a biodiesel amongst its inedible uses. The soap is commercially used in manufacturing personal care bathing products. 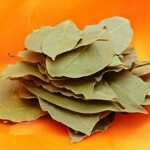 It is also used in beauty regime cosmetic products. The oil serves as a greasing agent in lubricating tools and machineries that are used in edible food manufacturing. It is used in greasing pipelines and tanks that are kept open to air. In order to protect them from rusting. This oil is also used in drilling mud to serve the purpose of the petroleum industry. It finds its usage in making of printing ink. It is also used in making glue. It is used in textile industry to lubricate the fabric before put through the acid process. The oil should be kept in an air tight jar and stored in a cool, dry place. It can also be frozen into blocks in order to have a longer shelf life. This oil has a shelf life of about 2 years if kept properly. Palm oil is one of the most popular oil and can be found in any departmental store or can be even bought online. 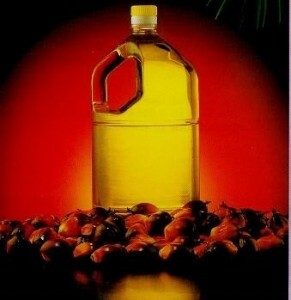 See the pictures below of this oil in its liquid form.